Well…. I recently sold my old Flashforge Creator Pro. We never really got along, it seemed that every time I was ready to do 3d printing it was feeling unwell. There were times when I looked at it wrong and it freaked. I swear. I wasn’t doing anything to it. I even left the room a few times thinking that my mad vibes were influencing it. Damned if it didn’t take that time to let the print break free of the print bed and go swishing around with every move of the extruder head. Enough…. I wasn’t finished with 3D printing, but that printer had to go. 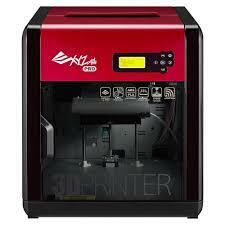 In the meantime I was surfing Youtube and came across a couple of videos on a new model of XYZprinting 3D printer. This new model allowed you to use 3rd party filament, had an aluminum heated print bed, had almost the same size build volumne as the Flashforge and was about half the cost. A teaser indicated that a laser engraver module was soon to come. Wow! It’s even on a bit of a sale on Amazon. Thirty dollars less than normal. Okay, so I’m sold. So a few days later it comes in via the UPS truck and I spend the next hour or so unpacking it and setting it up. I don’t turn it on yet. Not yet. I poured over the documentation and watched the Youtube videos first. Then I sleep on it. Now intially my impression is good. This printer just seems a little more finished than the Flashforge, more consumer friendly. It should be, it’s supposed to be you say. Flashforge Creator Pro is a workhorse, it’s a man’s 3D printer. Rubish. I’ll give you that the FF Pro is heavier built and has dual extruders, but it still seems unfinished, unrefined. The Da Vinci 1.0 Pro just seems so much more polished. So now it’s morning and my anticipation is high. It’s plugged in. I’ve read up on what it’s supposed to do when I flip the power switch. I even have a small simple print ready to test the printer. Moment of truth. I flip the power switch. At first everything is proceeding normally. The lights inside come on, the led displays the initialization message, the extruder starts moving to home position. I’m thinking al…..right….! Bang! Grinding….. Bang! The lights start flashing. The machine is beeping hysterically. The led flashs and finally displays Error 31. I slap power button off frantically, merciful silence. I’ve just ruined the printer by turning it on and lost nearly $600 I can’t afford to lose. So thinking I have nothing to lose, I turn the printer back on. Same horrendous banging and grinding as the extruder attempts to go to home. Finally the error is displayed on the led screen again. I turn the printer off again in frustration. I think great….. leave it to me to have problems with a new printer that nobody else has. I begin to have dej vu. But the extruder hot end isn’t hitting the bed and I’ve already checked half a dozen times to make sure I haven’t left any packing material in the machine, so what is causing the noise and error. Onto Google and several hours pass. It’s a new model. Not many people have bought it yet, much less had problems. Finally I find a single post on an obscure webblog. Like me the poster had just turned his new printer on and had the exact same thing happen. He has contacted XYZprinting and they have diagnosed the problem as a misaligned Y axis. Their solution, decidedly low tech. Bring the extruder assembly all the way forward and then pull hard on both sides where the black plastic covers are. Well what the hell…. It can’t get any worse, can it? I’m glad I didn’t find out. I do the hard pull and after a few minutes gather my courage up to flip the power switch back on. The printer comes on like before and the extruder assembly proceeds to home it’s axis. A little whine, a little stutter and then the quiet whir of the power fan on the back. The printer is homed and waiting patiently for my next command. I realize I need to tell my body to breath when the dark spots start dancing in my vision. At that point I decide to leave well enough alone. I call it a day.